The most complex of them all? Quick – think of a complicated project. Did implementing an ERP system in a large organization come to mind? Maybe developing a next-generation high technology product? How about starting a new venture? The new venture might not have been your first intuition. But take a step back and consider it. It represents the ultimate complicated project. All the complicated projects rolled up into one mega-complicated project. That new venture needs a new product or service. It needs an ERP system. It needs a strategy and a customer generation/retention process. It needs marketing and finance and human resources … and the list continues. Much work has sought to bring ideas and processes from project management to entrepreneurs, but surprisingly little has gone the other direction. In this article, we seek to expose a few things entrepreneurs, in many ways super-project managers, have learned from starting ventures, and translate them back into ideas for managing projects in larger organizations. As we do, it is important to appreciate one additional complexity borne by the entrepreneur. Aside from the broad aspiration of building a venture, the goals of the project (the venture) are uncertain at the start and can be subject to constant revision as the project unfolds. As such, the tools and approaches learned by expert entrepreneurs may be extremely valuable to project managers facing similar levels of uncertainty. Useful tools help capture relevant information, enable managers to strategize and facilitate a plan that fits project target, context and surrounding conditions. Thereby, tools differ in various aspects. Projects that have a fixed goal or objective use tools to sequence the steps and follow the most efficient linear, or causal logic (please see Figure 1; Traditional Waterfall). In situations of greater ambiguity, breaking a big project down into smaller “sprints” enables manageable work increments and allows for project objectives to evolve after the project has begun, by implementing agile or dynamic cycles (please see Figure 1; Agile or Scrum). But entrepreneurs face a far more open-ended problem. In addition to managing a different project for each function in the organization, it is unclear at the outset what the startup will end up doing. Certainly the objective is to create a viable venture, but that is a very broad goal. More than 90% of new ventures end up doing something different than the idea they started with (Reynolds, Carter, Gartner, & Greene 2004), so the notion entrepreneurs write a business plan and execute it in a systematic and organized fashion is naïve. Instead, the entrepreneurial approach to a project starts with the resources readily available at hand, explicitly incorporates feedback loops into the process, and functions atop elements within the control of the entrepreneur (Sarasvathy & Dew 2005). A stylized representation of the entrepreneurial approach is contrasted with the traditional and agile approaches to project management in the diagrams in Figure 1. Within the entrepreneurship literature, scholars have been fascinated to understand how experts in the domain think. Effectuation (Sarasvathy 2001) offers a clear and well-researched foundation of entrepreneurial expertise that we develop and apply to project management. Effectuation was induced from a cognitive science study of 27 entrepreneur founders (started multiple ventures, taken at least one to $250m in sales, spent more than 15 years in the domain). The central finding in effectuation is expert entrepreneurs focus on elements within their control “to bring about effect”, i.e. shape, develop, initiate, and create beneficial outcomes. Effectuation contrasts with causal or linear processes that build on prediction, goal-setting and forecasting. The general explanation for why expert entrepreneurs learn effectual heuristics is connected with their domain. New venture creation is an inherently uncertain activity, where (market) analyses are expensive and insufficient because of high complexity and unknown dynamics. In such a domain, predictions offer the entrepreneur limited meaningful input, so the entrepreneur adopts alternative heuristics. The entrepreneurial approach diagrammed in Figure 1 assumes the environment is constructible through the actions of the entrepreneur and her committed stakeholders, and enables project goals to emerge as negotiated residuals of stakeholder commitments. 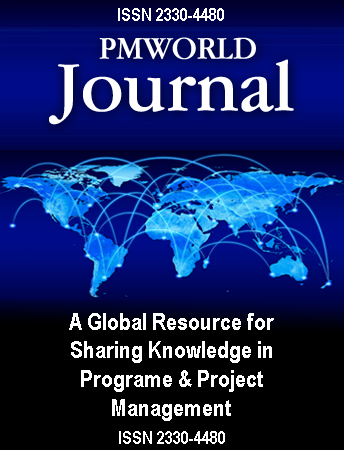 Editor’s note: The Advances in Project Management series includes articles by authors of program and project management books published by Routledge worldwide. Information about Routledge project management books can be found here.